President Ulysses S. Grant and Congress turned a blind eye to the disputed 1872 election of carpetbagger William P. Kellogg as governor of Louisiana. 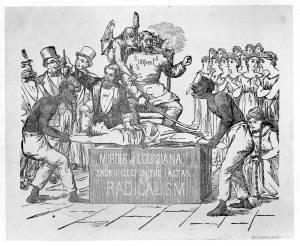 In this scene Kellogg holds up the heart which he has just extracted from the body of the female figure of Louisiana, who is held stretched across an altar by two freedmen. Enthroned behind the altar sits Grant, holding a sword. His attorney general, George H. Williams, the winged demon perched behind him, directs his hand. At left three other leering officials watch the operation, while at right women representing various states look on in obvious distress. South Carolina, kneeling closest to the altar, is in chains.